Farnham Town Council said a big thank you to the army of volunteers who contributed to the success of this year’s Farnham in Bloom at an awards ceremony (on Thursday 11 October). The annual awards began with presentations to local schoolchildren and were followed in the evening by the community awards. Recalling this year’s highlights, Lead Member for Farnham in Bloom, Councillor Stephen Hill said: “Farnham in Bloom is the success that it is because so many volunteers come together to work really hard and our business community steps up to support them. It’s our privilege as the Town Council to enable all of that to happen. The award categories reflect the breadth of work that goes into Farnham in Bloom, including fun projects that encourage children and families to join in, alongside those that challenge accomplished gardeners. Categories included the best hanging baskets, best allotment plot, best gardens (of varying sizes), the tallest sunflower, the best shop front, the best wildlife garden and South & South East in Bloom Certificates of Excellence. Over 120 awards were presented with Val and Doug Nye receiving the Mayor’s Special Award for all their volunteering in the Bourne Beautification Group, Frank Rhodes won Gardener of the Year and the new Madge Green Community gardening Award was presented to space2grow which is a local community project that aims to improve mental health and well being. Many of the sponsors, including principal sponsor Specsavers from Farnham, came to the prize giving and some presented prizes. Sponsorship, both financially and in-kind is a key part of maintaining the scale of Farnham’s entry to the In Bloom competitions and keeping the quality so high. Nearly 100 local businesses, organisations and individuals support the project and Farnham Town Council is always keen to partner with local businesses. Lateef Iqbal, store director from Specsavers in Farnham said: “We have thoroughly enjoyed our sponsorship of Farnham in Bloom over the last two years and it has been an honour to play our small part in seeing the campaign go from strength to strength. 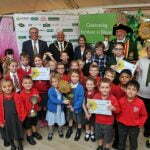 The Mayor of Farnham Councillor David Attfield hosted the awards ceremony which was held at Squire’s Garden Centre. Guests were treated to canapés and refreshments and took the opportunity to mingle and chat about this year’s entry which resulted in 14 awards for the town and surrounding villages in the South and South East in Bloom and the Britain in Bloom awards. Gold Award – Classical Floral Designs, Borelli Yard.